ProX Racing Parts high quality carburetor rebuild kits are the easy solution to rebuilding your carburetor. If your carburetor is leaking, or the fuel distributions is disturbed. ProX Racing Parts offers a kit with all components you need. The rubber O-rings are made of NBR rubber material with excellent resistance to the ethanol used in today’s fuels. Carburetors which are standard equipped with paper float bowl gaskets are upgraded to high performance Interface™ gasket material. 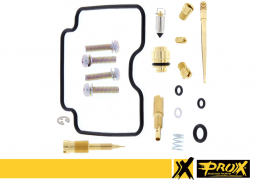 ProX Racing Parts carburetor rebuild kits include all of necessary components to repair a carburetor, including float bowl and cap hardware. ATV models with two carburetors include components to repair two carburetors. ProX Carburetor rebuild kits are available for a wide range of Dirt Bike and (Sport) ATV/UTV applications.